Methods of Manufacturing Process of Cement. 1. Dry Process of Manufacture of Cement. 2. Wet Process of Manufacturing of Cement. 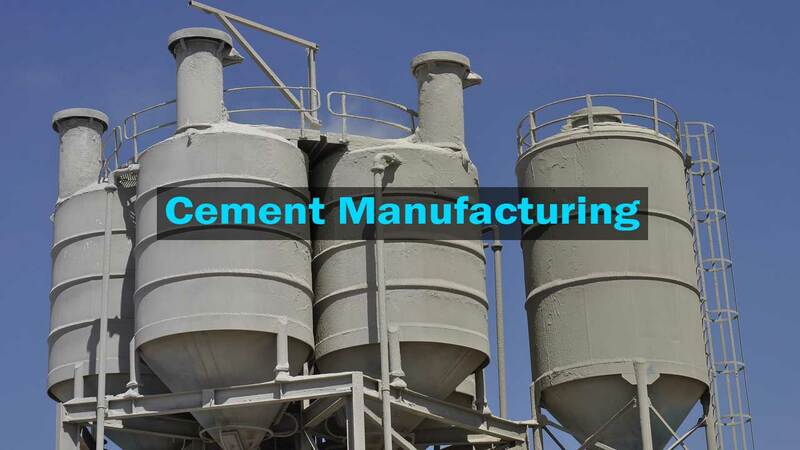 Cement manufacturing process & what is cement made of, it can be discussed conveniently under two headings: Selection of Raw materials and manufacturing methods. Most important raw materials (what is cement made of) required in the manufacture of Portland Cement are: Limestone, Clay, Gypsum, Fuel, and Water (in wet method). These are sedimentary, calcium carbonate rocks (CaC03). Most commonly they contain a small amount of magnesium carbonate also. Besides, usual impurities in limestones are those of iron oxides, silica, and alkalies. All limestones, therefore, are not suitable for the manufacture of Cement. It is essential that limestone selected for manufacture of cement should not contain. (iii) Iron Sulphides (more than 3 percent). These are also sedimentary rocks made up mostly of hydrated silicates of Aluminum. Like limestones, they also contain some impurities as iron oxides, free silica, alkalies, and magnesia. It is essential that those clays which are to be used for manufacturing of cement do not contain these impurities beyond the permissible limits. Some limestones are rich in the clayey matter to the extent of 30 percent. They are called cement rocks because they can be used as a single raw material for the cement manufacturing process. It is generally added in very small amounts (about 2% by weight) to the burnt cement (called Clinker) after it is taken out from the kiln and before it is sent for grinding. Gypsum is a sedimentary rock having a composition of calcium sulfate (Ca SO4. 2 H2O). It is added for imparting a retarding effect in the setting of cement. (Without gypsum the cement would set, within minutes after adding water into it. It will be, therefore, very difficult to work with such a type of cement. Addition of gypsum at the manufacturing time: however, increases the initial time to desirable limits). At present Portland Cement is manufactured by two processes, Dry Process, and Wet Process. The main difference between these two methods of manufacturing of cement is that in the dry process, calcareous and argillaceous raw materials are fed into the burning kilns in a perfectly dry state. ..and, In the wet process, however, these materials are supplied into the kiln in the form of an intimate mixture with water called SLURRY. i. Treatment Of Raw Materials. ii. Burning of the Dry Mix. iii. Grinding of the Clinker. You’ll know all the process below in details. The raw materials (limestone and clay) are subjected to such processes as, crushing, drying, grinding, proportioning, and blending or mixing before they are fed to the kilns for calcination or burning process. The crushing stage involves breaking the raw materials into small fragments that vary in size between 6-14 mm. Machines called Crushers are used for this purpose. The drying stage is typical of the Dry Process. Drying of crushed materials is essential and is achieved by heating these materials (separately) at temperatures sufficiently high to drive out uncombined water. Heating is done in drying kilns which are generally of the rotary type. The grinding of each material as obtained from the driers is done in two stages. First, the preliminary grinding, in which the materials are reduced to a fineness of 50 mesh. Ball mills are generally used for preliminary grinding. Second, the fine grinding, in which the size of the materials is reduced to 200 mesh. This is done by grinding in Tube Mills. Each raw material is thus reduced to a required degree of fineness and is stored separately in suitable storage tanks called SILOS or bins where from it can be drawn out conveniently in requisite quantities. Proportioning and Blending: Predetermined proportions of finely dried and ground raw materials are mixed together before they are fed into the kiln. The different materials thus combined together are mixed very thoroughly either by mechanical or by pneumatic methods. In the pneumatic blending, materials from different storage silos are simultaneously drawn off and fed into a single silo that now contains mixed material. In the pneumatic method, dry, proportioned materials are pumped under passive into a blending silo, where-from they are drawn in the mixed state. The blended materials are now ready for feeding into the burning kilns. From this stage onwards, there is practically no major difference between the dry and wet processes, except in the design of the rotary kiln. 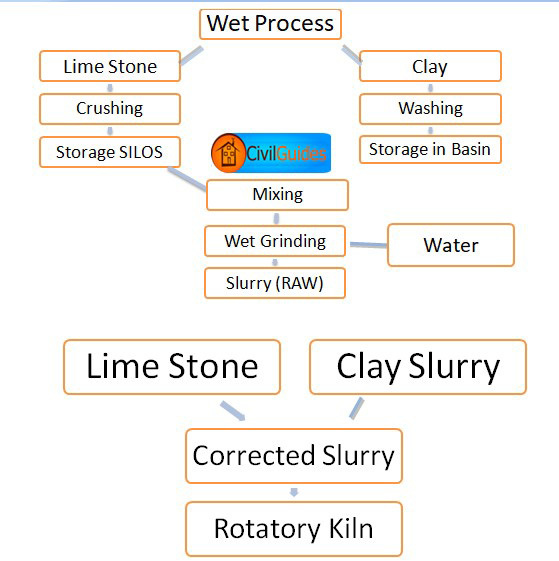 Flow Diagram of Cement Manufacturing Process by Wet Method. The well proportioned finely powdered mixture is charged into a long steel cylinder, called the Rotary Kiln. The kiln is adjusted in an inclined position, making an angle of 15 degrees with the horizontal and rotates around its longer axis (hence the name suggests). It has a charge end and a burner end, the former for introducing the materials (called feed) and the latter for supplying fuel. Rotary kilns differ in design and dimensions in accordance with the production requirements. Thus, these may be 100-180 meter in length, 3-5 meter in diameter and have a rotation of 60-90 revolutions per hour. Coal in finely pulverized form, fuel oil and gas are common fuels used in these kilns. The raw mixture is burnt in the kiln untill the proper burning is achieved. This is indicated by its taking a greenish black color and vitreous (shining like glass) lustre. This burnt material, now called CLINKER, it is cement in composition but not in size; it is in about walnut-sized lumps when it comes out of the kiln. (a) Complete dehydration: Water is completely driven off at the very initial stages of burning at temperatures as low as 400° C.
(c) Compound Formation: Lime and magnesia as formed above are combined in the next stage with silica, alumina and ferric oxide to form the basic compounds of cement, namely, the tri-calcium and di-calcium silicates, tri-calcium aluminates and tetra-calcium-alunino ferrite. These compound formation reactions start at temperatures around 1200°C and require temperatures as high as 1550°C for their completion. It is, therefore, natural that they take place near the burner end of the rotary kiln. Alkalies, moisture, and other harmful gases, etc. are all expelled as waste gases during the burning of the raw materials in the kiln. Watch the Video for better understanding. The completely burnt or calcined raw materials of cement are Converted to a lump-shaped product called clinker which is drawn out from the lower end of the rotary kiln. It is extremely hot when discharged, and is, therefore, first cooled in clinker coolers. A predetermined batch of gypsum (CaSO4. 2H2O) is added to the cooled clinker, and both (clinker and gypsum) are sent for pulverizing. The mixture is reduced to an extremely fine powder by grinding it in two stages; the preliminary grinding and the fine grinding. The preliminary grinding is achieved by using a gyratory type of crushers whereas for fine grinding use is made of tube mills. The tube-mill crushers are generally provided with air separators through which material of desired fineness can only pass. The coarser, portion of the cement is fed back into the mill for further grinding. This also forms a very important operational step since cement needs very careful packing and storage arrangements. It is, in fact, a delicate product and when handled carelessly can deteriorate to a useless set material. Cement is most commonly stored after its manufacture in specially designed concrete storage tanks called SILOS, where-from it is drawn off mechanically for the market. For cement packing, cloth, jute, and high-density Polythene (HDPE) bags are commonly used. For convenience, the cement comes to the customer in bags containing measured quantity. The standard bag of cement as distributed in India is commonly 50 kg or 112 .5 lbs. It is considered a better and convenient process for the manufacture of cement, especially where limestone of soft variety is available in abundance. We can discuss this process under three headings; preparation of slurry; burning or calcination; and treatment of clinker. Flow Diagram of Dry Method of Manufacturing of Cement. In Wet Process, raw materials are supplied to the kiln in the form of an intimate mixture with a lot of water in it. This is called SLURRY. To obtain the SLURRY of a standard composition, the raw materials are first crushed separately using crushers for limestones and grinding mills (wet) for clays. These crushed materials are stored in separate tanks or silos. They are drawn from the silos in prefixed proportions into the wet grinding mills where, in the presence of a lot of water, these get ground to a fine, thin paste. This is slurry which is stored in a third SILO. Its composition is tested once again and corrected by adding limestone slurry or clay slurry in required proportions. Such corrected slurry is then fed into the Rotary Kiln. For burning of the slurry, a rotary kiln of almost similar type is used as described under the dry process. In this kiln, however, the length of drying zone is larger because the material is fed into the kiln with abundant water. All the moisture is driven off from the slurry as it passes through the drying zone. In the subsequent zones, it undergoes the same transformation as mentioned under DRY PROCESS. In this stage, there is practically no difference in the wet and dry process. Read More: Concrete Slump Test – Definition, Types, Procedure. As the lump-shaped clinker comes out from the kiln, it is extremely hot. It is, therefore, passed through air-cooling rotary cylinders. After that, it is mixed with 3-4 percent of gypsum and ground to a very fine powder as discussed above in the DRY PROCESS of cement manufacturing. The fine cement so obtained is stored and packed in a way similar to that used in the Dry Process.